Book by tonight at midnight and get all of this free with stay! Save Up To $120 Off Nightly! Mt. 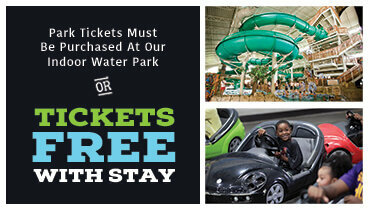 Olympus Indoor Water & Theme Park Included With Stay! Rates Starting As Low As $29.99. Visitors to Wisconsin Dells have the opportunity to experience the fun and excitement of the world’s largest Water Park and Theme Park Resort. The indoor and outdoor water and theme parks at Mt. Olympus feature more thrilling rides, exciting games, and cool activities than any other Dells attraction. Whether you want to feel the rush of the Hades 360 Rollercoaster., or take a wild spin the Tea Cups, there’s more than enough fun for every member of the family! Visit Mt. Olympus for the most exciting water park rides in Wisconsin Dells, with indoor and outdoor water parks so you can splash, slide, and swim year-round. Experience the power of nine-foot waves at Poseidon’s Rage...Or, if lounging is more your style, float down the Endless River for beautiful views of the entire park. 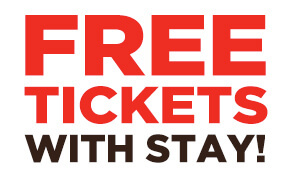 And don’t forget, admission is always free for overnight guests of all three Mt. Olympus Resorts! 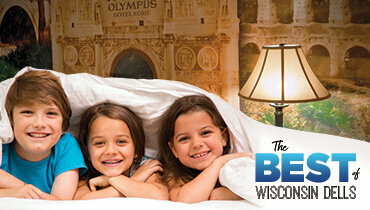 Treat your family to the ultimate Wisconsin Dells resort experience and book your stay at Mt. Olympus Water Park and Theme Park Resort today! Featuring five hair-raising roller coasters, including Hades 360 with an upside-down 360-degree roll and a 65-degree drop, 7 go-kart tracks, 44 steep and slippery slides, Poseidon’s Rage Surf Pool – with waves up to 9 feet tall, kiddie play areas, and more! There is something for everyone. 200 acres of theme park and water park fun! Located in Wisconsin Dells, the waterpark capital of the world!